President Donald Trump has taken steps to streamline the permitting process for manufacturing. He also wants pipelines to be made in the U.S., and an expedited process for environmental reviews and approvals. The steps came as Trump signed executive actions to advance construction of the Keystone XL and Dakota Access oil pipelines. Former President Barack Obama blocked construction in late 2015 of the Keystone line from Canada to the U.S. Meanwhile, the Army Corps of Engineers is studying alternative routes for the Dakota Access pipeline. Trump describes the regulatory process as a "tangled up mess." He says if the answer is no, it should be a quick no. If the answer is yes, Trump says "let's start building." President Donald Trump says he will announce his pick to fill the vacant Supreme Court seat sometime next week. Trump told reporters in the Oval Office on Tuesday that he'll be "making my decision this week" and "we'll be announcing it next week." "We have some outstanding candidates," the president said. "And we'll pick a truly great Supreme Court justice." The Supreme Court has only had eight justices since Justice Antonin Scalia died last year. President Barack Obama nominated a replacement but Republicans in the Senate refused to bring the choice up for a vote. During his campaign, Trump publicly identified nearly two dozen candidates for the vacancy. President Donald Trump has signed executive actions to advance the construction of the Keystone XL and Dakota Access oil pipelines. Trump tells reporters in the Oval Office that the moves on the pipelines will be subject to the terms and conditions being renegotiated by the U.S.
President Barack Obama killed the proposed Keystone XL pipeline in late 2015, saying it would hurt American efforts to reach a global climate change deal. The pipeline would run from Canada to U.S. refineries in the Gulf Coast. The U.S. government needs to approve the pipeline because it crossed the border. The Army decided last year to explore alternate routes for the Dakota pipeline after the Standing Rock Sioux tribe and its supporters said the pipeline threatened1 drinking water and Native American cultural sites. FBI Director James Comey is staying in his job. A Justice Department memo lists him among officials remaining in their positions. FBI directors are appointed to 10-year terms intended to carry across presidential administrations, even when a new party takes over the White House. President Donald Trump criticized the FBI during the campaign for its decision not to recommend charges against his Democratic opponent, Hillary Clinton. But he also appeared to warmly greet Comey at a law enforcement gathering over the weekend. Comey is in his fourth year in the job. The New York Times first reported that Comey would stay on. The director's job has been a 10-year term since 1976. Since then, only one has been removed prematurely -- Reagan appointee William Sessions by Bill Clinton in 1993. President Donald Trump is expected to take executive action Tuesday to advance construction of the Keystone XL and Dakota Access oil pipelines. That's according to a person with knowledge of the action. The president is scheduled to sign orders at the White House late Tuesday morning. Former President Barack Obama killed the proposed Keystone XL pipeline in late 2015, declaring it would have undercut U.S. efforts to clinch a global climate change deal that was a centerpiece of his environmental legacy. The pipeline would run from Canada to U.S. refineries in the Gulf Coast. The U.S. government needed to approve the pipeline because it crossed the border. The Army decided last year to explore alternate routes for the Dakota pipeline after the Standing Rock Sioux tribe and its supporters said the pipeline threatened drinking water and Native American cultural sites. The person with knowledge of the decisions insisted on anonymity because they were not authorized to confirm the moves ahead of a formal announcement. President Donald Trump says he's an environmentalist. The president made the comments Tuesday at a breakfast with auto industry executives. He didn't elaborate on why he sees himself as an environmentalist, but the comments came after urging companies from the auto industry and beyond to bring jobs back to the U.S.
On Monday, he made similar comments at a business breakfast, stating, again without elaborating, "I'm a very big person when it comes to the environment. I have received awards on the environment." 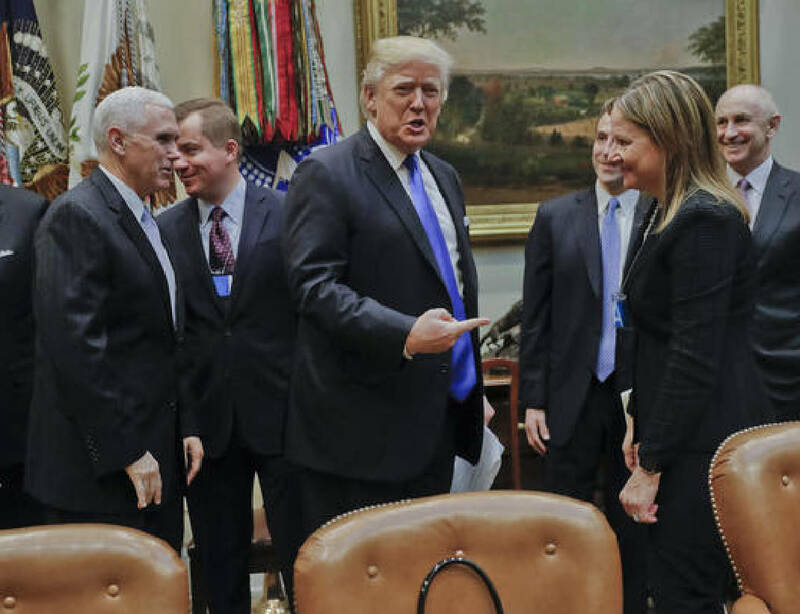 President Donald Trump is spending the morning meeting with auto executives as part of his push to bring jobs back to the U.S.
Trump told his guests Tuesday at the White House that he's looking to ease regulations to help auto companies and any other businesses wishing to do business in the U.S. Among the attendees of the breakfast are Ford Motor Co. chief executive Mark Fields, Fiat Chrysler CEO Sergio Marchionne and General Motors chief executive Mary Barra. President Donald Trump's efforts to build bridges and push through his agenda have been overshadowed once again with his continued fixation on the election and more false claims. During a bipartisan reception with lawmakers at the White House late Monday, Trump claimed the reason he'd lost the popular vote to his Democratic rival was that 3 million to 5 million immigrants living in the U.S. illegally had voted. That's according to a Democratic aide familiar with the exchange who spoke on condition of anonymity to discuss the private meeting. There is no evidence to support Trump's claim. Trump on Tuesday will continue his outreach efforts as he meets with executives from the auto industry and speaks by phone with Indian Prime Minister Narendra Modi.